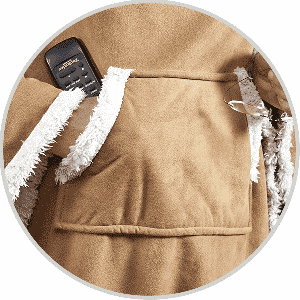 Snug-Rug™ Sherpa …the blanket with sleeves & pouch pocket! Warm, cosy and lightweight sleeved blanket, with luxury anti-pilling coral fleece, pouch pocket and carry case. Engulf yourself in luxury with one of the most sumptuous sleeved blankets you will ever snuggle up in. The Sherpa has been designed for versatility with its oversized sleeves and a handy pouch pocket that keep you hands free as well as warm, snug and self-indulgent! Perfect for those cold winter nights! Spoil yourself daily with the new Snug-Rug™ Sherpa! With oversized sleeves for freedom and comfort. With handy pouch pocket for your remote control, glasses or mobile phone. Packaged in storage / carry case for travelling. Measures: 152 x 214cm (60” x 84”). 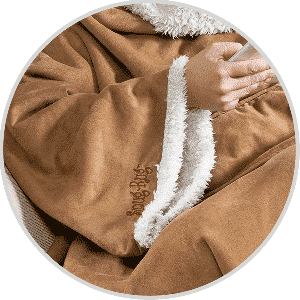 Made from: 100% Polyester, soft faux suede outer shell and a gorgeous sherpa fleece lining.